Earlier this year, there was university research released supposedly showing “baby brain” does not exist. We all know baby brain _ the condition pregnant women face whereby their unborn eats away at their brain cells causing incidents where mobile phones are placed in the fridge and a block of cheese is plugged into the phone charger. Well, some uni geek spent time and no doubt taxpayer money trying to disprove this “supposed” condition when all of us husbands/partners have been compiling evidence for years. In fact, since the birth of now six-month-old Princess Holly (a sister for three-year-old Princess Ella), I’ve been working on my own research to prove “baby brain’’, in fact, lives on long after the birth. Yes, six months on and I think Holly is still causing the condition in my good wife, Princess Kel. In fairness, my studies have concluded the probability of the lack of sleep our party animal baby is causing Kel is only causing the baby brain to be more acute. Nevertheless, baby brain it is. Case in point: grocery shopping the other day. We’re standing at a crowded and cramped checkout with a handful of groceries and Baby Holly is starting to throw a wobbly (cue: grunting, squealing and general unpleasantness). I tell Kel I’m heading out of the store to wait outside with Holly and make a hasty retreat, leaving her with the well-behaved three-year-old and three light bags of groceries. Minutes later, I’m standing cuddling a now entertained and happy bub when Kel and Ella walk blissfully from the store. It’s as they stroll happily up to me I notice there is something missing ……….. the groceries. Seconds later, out of the building comes a red-faced shop assistant screaming at the good wife “you forgot your groceries’’. The looks of peace on Kel’s face turns suddenly from “wtf, how did that happen?’’ to “omg, I’m such an idiot’’. I can’t help it but to break out in hysterics. What follows is plenty of excuses “I thought you’d taken them earlier”, “I was getting them home delivered” and “they were going to email the groceries to us’’. Yeah, right. Baby brain, guilty as charged. Take that, uni geek. 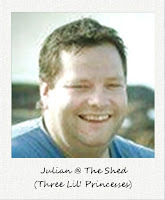 Julian blogs in The Shed, a virtual room inside his wife Kel’s blog Three Li’l Princesses. Known as the Bloke in The Shed, he is also a newspaper deputy editor and dad to Princesses No. 2 and 3. He is married to his iPhone and is finding a thinner version of himself via the Nintendo Wii. You can sometimes find him hanging out on Facebook, but refuses to join Twitter. Oh Julian i have to agree baby brain is most definitely real. Pre-children i was very much on the ball, i remembered all sorts of stupid details, like my best friend from primary school, who i hadn't spoken to in over 8 years number and birthday by heart. Que getting pregnant and i cannot even remember my own bloody birthday. And to Kel, we have all done it. I have actually left without my wallet and just the groceries before. Lucky there are still a few honest people out there! Forgotten groceries. What new parent hasn't been there? One day, let's hope there's a cure for baby brain. Baby brain is a rite of passage, and anyone who claims it doesn't exist obviously hasn't done the 'grocery forgetting trick' LOL! Hilarious! I love it. Great post! Does "baby-brain" still apply when it's men who leave stuff behind at the checkout? Because that does happen! Ha ha, great read! We left a 24-pack of toilet paper rolls at the supermarket the other day and don't yet have kids so I shudder when thinking what baby brain will do to us/me. Baby brain is uncanny Miss Pink and I can honestly believe forgetting your own birthday! A cure for baby brain. Now that would be a university study worth funding! Exactly Skye. Could not agree more. Who dares dispute The Baby Brain existence. It's not like we're talking about whether Elvis or Osama Bin Laden are really dead. Baby Brain really exists. It is totally not our fault that the bananas were left on the car roof. I certainly know that one - it's like how women can easily use any gadget you give them - but Mums can't. How does that happen? Why can't Mums record anything off the TV? that is hilarious and golden. I think it's called nappy brain after the baby is born. that's because they secretly (or not so secretly) resent anyone who has enough time to watch something that has been recorded. That person should be doing all that stuff he said he would do instead of watching criminal minds. Or something else. I don't know. what? I recommend getting your groceries delivered when you become a parent. I gotta agree with this one. I don't have the time or patience to sit down for 2 seconds and figure it out when I can just say "I don't know" and be done with it.